NEW YORK, April 16, 2019 – The State University of New York (SUNY) College of Optometry will recognize Hubert Sagnières, chairman of the Essilor Group and executive vice chairman of EssilorLuxottica, and Dr. Donald Hood, professor of psychology and professor of ophthalmic science at Columbia University, with honorary degrees during its 2019 commencement ceremony on Thursday, May 23 at the Roosevelt Hotel in midtown Manhattan. 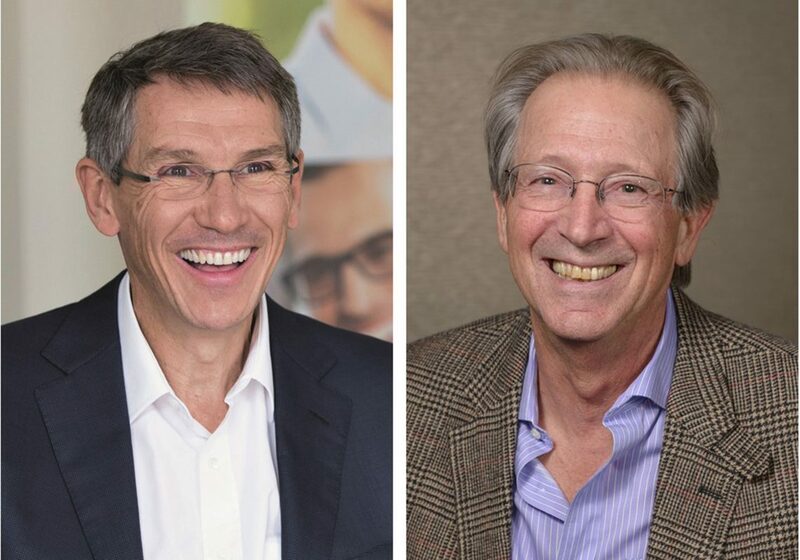 “It will be an honor to recognize these extraordinary gentlemen for their respective humanitarian and scientific efforts to advance quality eye and vision care for all,” said SUNY Optometry president David A. Heath. Hubert Sagnières will offer the commencement address and receive the honorary doctorate of humane letters for his commitment to improving lives by improving sight throughout the world and his leadership in corporate philanthropy and strategic giving. Mr. Sagnières has been the driving force behind Essilor’s ambitious goal to eradicate poor vision across the globe by 2050. Key efforts include the creation of the Essilor Vision Foundation, Vision Impact Institute, Vision for Life social fund and the inclusive business models of Eye Mitra in India and Vision Ambassador in China and other countries. He was also instrumental in the launch of a partnership with the Vision Catalyst Fund, which is an initiative of the Queen Elizabeth Diamond Jubilee Trust. Mr. Sagnières joined Essilor as global marketing director in 1989. He served as president of Essilor Canada, Essilor Laboratories of America and Essilor of America, group executive director for North America and Europe and Essilor’s chief operating officer and director before becoming chief executive officer in 2010. He received a degree in economic science from École Centrale de Lille and an MBA from INSEAD in France. Dr. Donald Hood will receive the honorary doctorate of science for five decades of research addressing the behavior, physiology and anatomy of the human visual system. His more than 300 publications have concerned the basic neuroscience of vision and diseases of the retina and optic nerve. Dr. Hood is the James F. Bender professor of psychology and professor of ophthalmic science at Columbia University, where he has been a member of the faculty since 1969. He was the university’s vice president for the arts and sciences from 1982 to 1987 and has had continuous grant support from the National Institutes of Health/National Eye Institute for more than 45 years. Beyond his own research, Dr. Hood is editor-in-chief of Investigative Ophthalmology and Visual Science, serves on the editorial boards of Journal of Glaucoma and Documenta Ophthalmologica and is an elected fellow of the American Academy of Arts and Sciences, the Society of Experimental Psychologists and the Optical Society of America. Dr. Hood holds a bachelor’s degree from Harpur College, now known as Binghamton University, and master’s and doctoral degrees from Brown University. He also received an honorary doctorate of humane letters from Brown in 2017 and an honorary doctorate of science from Smith College in 2000. Founded in 1971 and located in New York City, the State University of New York College of Optometry is a leader in education, research, and patient care, offering the Doctor of Optometry degree as well as MS and PhD degrees in vision science. The College conducts a robust program of basic, translational and clinical research and has 65 affiliated clinical training sites. SUNY Optometry is regionally accredited by the Commission on Higher Education of the Middle States Association of Colleges and Secondary Schools; its four-year professional degree program and residency programs are accredited by the Accreditation Council on Optometric Education of the American Optometric Association. All classrooms, research facilities and the University Eye Center, which is one of the largest optometric outpatient facilities in the nation, are located on 42nd Street between Fifth and Sixth Avenues in midtown Manhattan.